A 7" tablet is, in my personal device ecosystem, an essential device. It is my go-to device for reading news (thanks to the Inoreader Android App), managing email, keeping up with the Delos crew on YouTube, and controlling my multi-speaker Sonos system via the Android Sonos Controller App. My iPad 2 goes largely unused except when in situations where WiFi is not available and its 3G capability keeps me connected. When my beloved Nexus 7 bricked, the new Amazon Fire 7" called my name. At $50 per unit, or six for $250 (buy five get a sixth free), Amazon hits a compellkng price point for a 7" tablet. It's an impulse buy. A "why not?" A "nothing to loose" and (possibly) much to gain value proposition. But is it? The specs are promising. The screen is crisp (171 ppi / 1024 x 600). The 1.3 GHz quad-core processor is capable. The 8 GB of on-board storage can be expanded to 128 GB by addition of a micro SD memory card. Lots of storage head-room there. And, in the field, the battery yielded full day use. Yep, lots to like. (For full specifications go here). The operating system, a variant of Android, is much more Androidish than the first generation Fire Tablet. Amazon's take on the Android OS has a custom launcher that ties the Fire tightly into the Amazon ecosystem. One screen displays recent activity, including books read, movies watched, apps, etc. That recently used page proved useful. Another launcher page displays all installed apps. The remaining launcher screens are devoted to pitching Amazon content (books, audio books, movies, apps, games, etc.). Indeed, on powering up the device one is greeted by a pitch for a app or other goodie available from Amazon. In short, this tablet has a lot going for it. And at $50 a compelling impulse buy. The Kindle Fire 7" is tied to the Amazon app store. If you intend to consume Amazon content exclusively, that works well. The Amazon app store is stocked with myriad apps beyond Amazon's. However, the collection is unpredictable. And this unpredictability may prove to be a deal breaker (or force purchase of a different tablet). For example, the GoPro app is not in the Amazon app store. Neither is the lovely Wunderground weather app. On the bright side, the Sonos Android Controller app is available from the Amazon App store. And, oddly, the Amazon app store includes the NetFlix app (a direct competitor to Amazon's Prime Video), but does not stock the YouTube app. The Amazon app store's limitations loom largest if, like me, you are thoroughly integrated into the Google ecosystem. The Amazon app store stocks none, nada, zip, zero of Google's fantastic Android apps. No Gmail, no Drive, no Pictures, no Sheets, no Calendar. No YouTube. As workarounds, the Amazon app store includes apps that are pointers to full screen browser sessions for Gmail, Calendar and YouTube. While a step in the right direction, these bookmarks are less than ideal if you use Google services. The Kindle Fire ships with native email and calendar apps. The email app lacks the email sorting functionality that make the Gmail app so useful, and renders email a useful tool. The email app that ships with the Kindle Fire 7", because it lacks the magical email sorting functionality that Gmail and Inbox execute so well, managing daily email, given my typical volume is not possible. The calendar app that ships with the Kindle Fire 7" is serviceable. 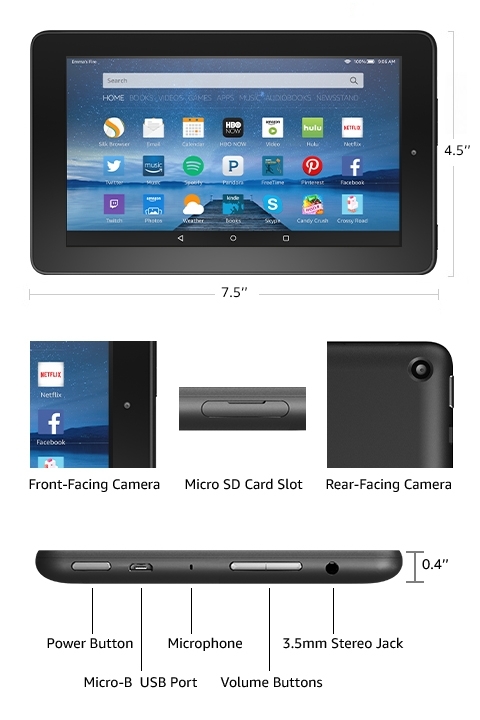 How does the Kindle Fire 7" function as an Amazon consumption device? I'm not a big movie watcher and play no games, so no insights are available on those fronts. The Kindle reading experience is, oddly, challenging. I found it challenging to access the menus without flipping several pages back and forth in the process. My Kindle PaperWhite provides a much more satisfying, and less frustrating, reading experience. After using the Kindle Fire 7" for two weeks, with growing frustrations due to the lack of Google apps, I yielded to the call of an Acer Iconia Tab 8 while making a CostCo run. Early impressions are very favorable. The screen is fantastic! It provides a fairly straight-up Android 4.4 experience. One concerning factor is that Acer is providing no guidance on whether and when Android updates will be available. Having experienced the ugly side of upgrading too soon, I'm currently happy with the rock-solidness of Android 4.4 Kit-Kat. We'll see how it performs over time. Meanwhile, please share in the comments your experiences with the Kindle Fire 7" or the Acer Iconia Tab 8.